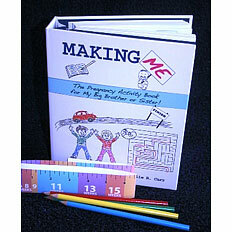 TDmonthly® - New Toys and Games: Making Me: The Pregnancy Activity Book for My Big Brother or Sister from MOTHERLY WAY ENTERPRISES INC.
From: MOTHERLY WAY ENTERPRISES INC.
Other products from MOTHERLY WAY ENTERPRISES INC. This hardcover book for siblings of the baby-to-be includes all sorts of information and fun activities, including coloring, measuring, counting, journaling and more. It covers every day of the nine-month pregnancy, and includes four colored pencils and a 24” measuring tape to track the baby’s growth. "This is the only day by day pregnancy activity book for the sibling written entirely from the baby’s point of view," Motherly Way Enterprises Inc. Founder and Author Julie Carr told TDmonthly. "It is pediatrician and child psychologist recommended to help the big brother or sister understand and bond with the new baby." · Should You Decorate Your Retail Store For The Holidays? If So, How?